This is a 1985 Barry Bonds Game Used Rookie Bat - The future single-season and career Home Run King was still just "Bobby's kid" when this rare and important early lumber was shipped to him from Louisville on July 10, 1985, just a month after signing as the Pittsburgh Pirates first round draft pick. The block-letter "Bonds" P72 exhibits heavy use with a cracked lower barrel, likely in minor league competition prior to his April 20, 1986 Major League debut. 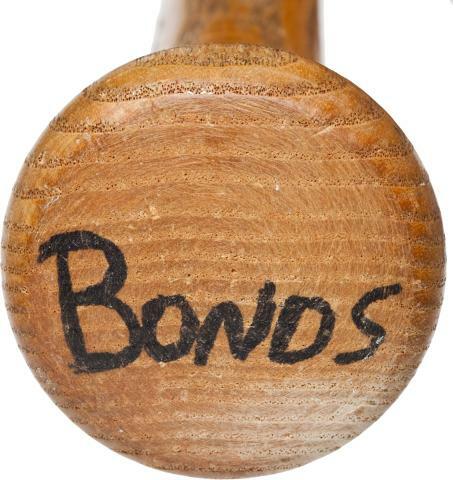 Ball, stitch and cleat marks decorate the barrel and a handwritten "Bonds" appears in marker on the knob. Length is thirty-four and a half inches; weight is thirty-two ounces. While scandal has tarnished the reputation of the game's greatest long ball artist, the same was true of Shoeless Joe Jackson and Pete Rose, and they have rebounded nicely with the soothing passage of time. 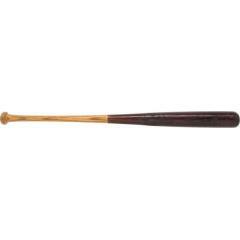 This remains the earliest known bat of the Home Run King, which will sound like quite a treasure when Bonds claims his rightful place in the Hall of Fame and the baseball pantheon. Graded GU 8. Includes a Letter of Authenticity from PSA/DNA. To inquire about adding this fine piece of memorabilia to your collection please use the contact form provided and a customer service representative will be in touch to discuss its acquisition.